Let it never be said that the Costanzos can’t wing it with style! 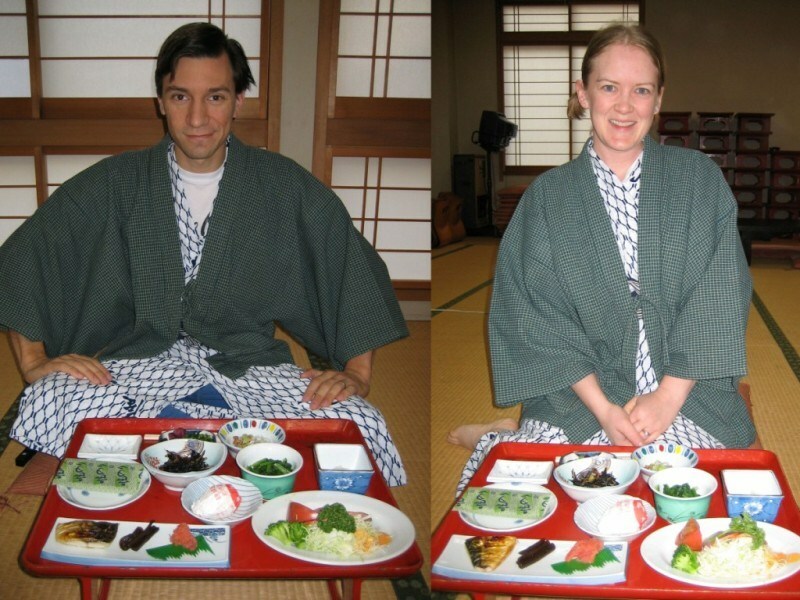 This Friday, Mike says to Jen, “Hey Honey, how does a weekend trip to a ryoukan (Japanese-style inn) sound?” Jen says, “Sounds great, but where?” “We’ll find out when we get there!” replies Mike with a grin. Yup, on Saturday afternoon we set out for a weekend getaway with no reservation, no specific place in mind, and no plan whatsoever. With the aid of a brochure entirely written in Japanese (see below), we set out for a place called Bandai-Atami that we heard had some great places to stay. When we got there we broke out our map and started going from place to place asking if there were vacancies. Sure enough, we found one. It was called Komatsu Ryoukan (#2 on the guide map), and from the minute we walked in we got the royal treatment. The ladies there were big-time nice, and took care of everything for us (like laying out our futons when it was time to go to sleep). The room was totally Japanese-style–tatami floors and rice-paper sliding doors. We got to wear special lounging robes called yukata. The food was absolutely amazing–top-notch quality. And the baths—incredible! Neither one of us had ever been in water that hot. When we got out after less than 10 minutes, we both felt dizzy! Needless to say, we were lovin’ every minute of it! What a fun adventure! Neither one of us had ever done anything this spontaneous or, well, reckless before. We’re usually big-time planners, and when we go on trips we plan stuff down to the minutest detail–phone numbers and everything. But there was nothing to plan here, just life waiting to be experienced. And you know what–it was great. We even got some insider info on where the best onsen (hot spring resorts) are, so maybe we’ll just pick up and go there too, someday. You never know where the Costanzos will end up! Us at breakfast. No stale bagels and fake butter here–this was incredible dining. There must have been almost 20 kinds of food in front of us. And if you think this is exorbitant, you should have seen dinner. We’re talking about 15 plates with a total of 30 different kinds of food. Incredible! Us relaxing in the ultra-hot bath water. It was so hot that the whole room was filled with steam. We walked out of there like ultra-relaxed zombies. PreviousMike, Jen, and the Sugaya P.T.A. Band Perform!!! NextHarvest Blessings…. and More Blessings….